It was only on the second day of PAX East, wandering the PlayStation booth, that I noticed the Grand Kingdom demo station. I instantly felt both a little embarrassed (at the fact that I’d forgotten all about it through the chaos) and excited (that I’d have another upcoming RPG to cover). Coming in just a few months to PS4 and Vita fans in the West, MonoChro’s Grand Kingdom brings some unique twists to the tactical role-playing genre and should be on the radar of JRPG fans who enjoy a little timing-based action in their combat. The chief twist of Grand Kingdom wasted no time showing itself to me — when I picked up the controller, someone had already left the demo in mid-battle. That meant thinking on my feet, but I quickly picked up the gist of its unique combat system. Battles take place on a series of “lanes” stretching from one end of the screen to another. Characters can jump vertically to a lane above or below them, then move horizontally along the lane they’re currently on. Doing so depletes a meter along the bottom of the screen, and reaching the end of it stops your character in their tracks (although you can still change their facing at that point). Once you’ve got your character where you want them to be, you can perform one of the actions assigned to the face buttons. For example, my healer-type character had the ability to throw a healing potion that would cure surrounding characters or an acid vial that could damage enemies, while my mage-type character had a number of different spells to choose from with different ranges and elemental properties. Range is extremely important to consider in Grand Kingdom; it took me a while to get a hang of lining up my party members just right so they could hit enemies from afar (of course, in the case of melee characters, this isn’t such a big deal). Once you’ve lined everything up properly, though, you’re still responsible for making sure your attack lands. Once I set my archer up with an enemy in his sights, the camera switched to the yellow “range” line where his attacks could potentially land. A target ran along the line on the bottom, and I had to time the press of my button when it lined up with the enemy in question; if I was successful in timing it correctly, another target would appear, allowing me to combo my foe with a flurry of arrows. And while you may not have to time things to the same degree with close-range melee characters, placement is still important — getting behind an enemy and landing an attack instantly breaks their guard, allowing you to maximize your damage potential. I only got to explore the field briefly, but what I did see was pretty interesting. The maps in Grand Kingdom are set up like game boards, with individual spaces you can move to and enemies represented by chess-like pieces. Certain obstacles and immovable, super-strong enemies can be avoided with the use of learnable field moves, and there are naturally multiple branching paths with treasures available (some are even hidden until you step on certain tiles). While the demo map was pretty simple, mostly meant to serve as a tutorial, it was easy to imagine how things might grow more complex and interesting as the game goes on. 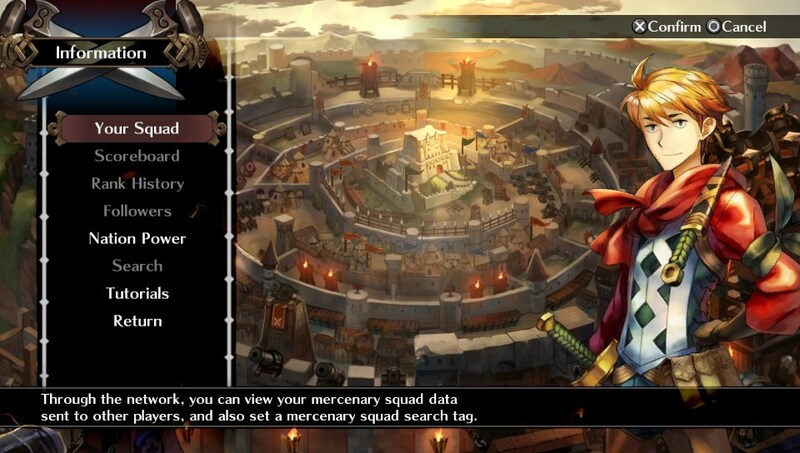 Visually, Grand Kingdom is looking pretty great so far. Chizu Hashii’s character designs look bold and colorful with the game’s big sprites, and the appealingly simple interface played a big role in helping me pick up the game’s basics so quickly. The animation quality is pretty high, too, making the combat feel and look sort of like a turn-based fighting game. The scenery around it is impressive too, with detailed foregrounds and backgrounds that create a layered effect. NIS America is bringing Grand Kingdom to our shores in two months, and if my preview is any indication, I think JRPG fans are really going to enjoy the game’s interesting twists on the tactical role-playing formula. While it might be tricky to get used to, the lane-based combat has intriguing potential — and we haven’t even yet seen how it fits into the rest of the character-creating, kingdom-conquering madness. If you think you’re of a mind to enjoy MonoChro’s tricky new SRPG, take heed: the game will be released on PS4 and Vita for $59.99 and $39.99, respectively, on June 21. The PS4 version also comes in a Limited Edition if you’re so inclined, which will run you $79.99.